PALO ALTO, CA – October, 12, 2016 -- Mindflash Technologies announced today that they have been named to the Top 35 Best US Small Company Workplaces by Fortune and the consulting firm Great Place to Work®. This Silicon Valley software start-up, producers of the leading cloud-based learning management solution for large and fast-growing companies, won this accolade from the more than 52,000 employee survey results submitted to Great Place to Work® this year. “Mindflash is a flat out awesome team,” shared Donna Wells, Mindflash CEO. “I’m delighted and honored that our employees’ candid responses to this extensive survey put us in the top fraction of 1% of small companies in the US. We have something truly special going on here, both for our employees and our customers.” The company’s award-winning online training software has earned industry-leading customer satisfaction ratings since its 2010 introduction and was recently cited by Forrester as the leading, stand-alone Learning Management System. 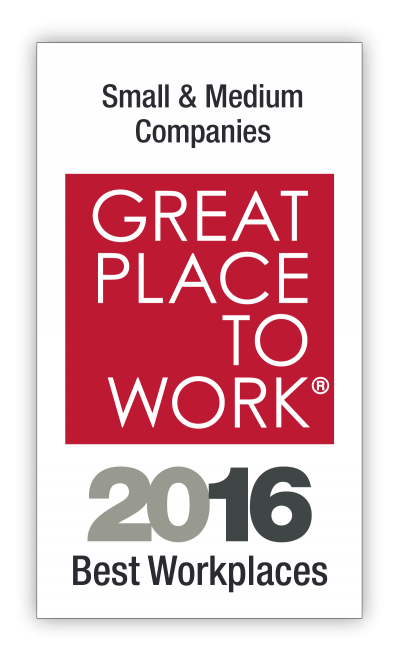 Mindflash was named a certified Great Place to Work in 2015 and 2016, and was ranked as the #4 Best Workplace for Flexibility in March 2016 by Fortune and Great Place to Work. “There’s a generosity of spirit that infuses the Best Small Workplaces—one that has a measurable return,” said Kim Peters, Executive Vice President of Great Place to Work. “Whether it’s funding employee ‘passion projects’ or giving surprise gifts to customers, the best workplaces pay it forward. And they then get it back in the form of inspired people who innovate harder and generate higher revenue.” Among the findings from the study: the Best Small Workplaces drive roughly three times the revenue growth of their peers, even as they provide a better experience for their people. Published together with our partner, Fortune, the Best Small & Medium Workplaces rankings are based entirely upon feedback from more than 52,000 employees at Great Place to Work–Certified companies. Employees completed our anonymous Trust Index© survey, answering questions about how frequently they experience the behaviors that create a great workplace, including, for example, their assessment of the honesty and quality of communication by managers, degree of support for employees' personal and professional lives and the authenticity of relationships with colleagues. Great Place to Work® is the global authority on high-trust, high-performance workplace cultures. Through proprietary assessment tools, advisory services, and certification programs, including Best Workplaces lists and workplace reviews, Great Place to Work® provides the benchmarks, framework, and expertise needed to create, sustain, and recognize outstanding workplace cultures. In the United States, Great Place to Work® produces the annual Fortune "100 Best Companies to Work For®" and a series of Great Place to Work® Best Workplaces lists, including lists for Millennials, Women, Diversity and over a half dozen different industries.